GERRY ADAMS HAS said it is “unacceptable” that he was unable to attend a St Patrick’s Day event at the White House last night after he was delayed by security personnel checking his documents. The Sinn Féin president was due to attend the annual event hosted by President Barack Obama, along with deputy leader Mary Lou McDonald and the North’s deputy first minister Martin McGuinness. However he was prevented from entering the White House by security personnel who delayed him for 90 minutes before he decided to leave. A Sinn Féin spokesperson initially described it as an “administrative problem” but Adams said in a later statement that he was informed by White House staff of “an issue with security” when he arrived last night. After two decades of travelling back and forth to the USA and countless meetings in the White House with successive US Presidents, this is an unacceptable development. It is obvious that there remain some within the US administration who seek to treat Sinn Fein differently. Adams also claimed that last year the US State Department initially refused to meet him as part of a “transparent effort to pressurise Sinn Féin during negotiations at Stormont”. “That meeting did take place after protests from US political leaders. Efforts to pressurise us in the negotiations failed,” he said. The US Secret Service, which has responsibility for security at the White House, tonight said it regrets the incident, which it put down to an “administrative input error”, in a statement sent to TheJournal.ie. The Secret Service would like to express our regret that the issue involving Mr. Gerry Adams’ entry into the St. Patrick’s Day reception could not be resolved in a more timely manner. Unfortunately, an administrative input error received by the Secret Service was not able to be rectified promptly. A spokesperson for Adams tonight told TheJournal.ie that nobody from the US Secret Service or the White House had contacted the Sinn Féin leader to apologise or discuss last night’s incident. However, the spokesperson noted that representatives from the US State Department (the equivalent of our Department of Foreign Affairs) were “very apologetic” during a meeting with Adams this afternoon. Neither the Secret Service nor a White House spokesperson addressed questions regarding Adams’ claim that Sinn Féin was “treated differently” at the event or that staff cited “security” in preventing him from entering. The spokesperson was at that stage unable to provide more detail, saying that Adams was in meetings with US congressmen and senators on Capitol Hill and could not be reached. Adams said that at those meetings with the Congressional Friends of Ireland, the US politicians shared his “grave disappointment at the White House situation and expressed their determination to have this issue resolved”. Sinn Féin will not sit at the back of the bus for anyone. We are elected to represent citizens and we will do this. I am hopeful that the controversy around my White House invitation will help lead to a resolution of all these matters. 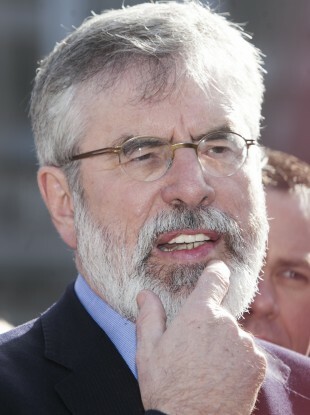 According to IrishCentral.com, Adams was pulled aside from the Sinn Féin visiting party by security personnel who examined his documents. After he was left waiting for 90 minutes while his passport was checked, Adams decided to leave the event when it appeared there was no resolution. McDonald and McGuinness attended the event where Taoiseach Enda Kenny presented Obama with the traditional bowl of shamrock. Speaking at Leinster House today, Sinn Féin TD Aengus Ó Snodaigh said he wasn’t aware of the incident but said it should not have happened. “No political representative should be left out but we’ll see what exactly is involved,” he said. As far as I know he [Adams] is meeting senators and congressman at the moment in the United States but I’m not across the detail of what’s happening in the States. The Dublin South-Central TD said it is a matter for the US authorities. The Sinn Féin spokesperson earlier noted that Adams has been to the White House on numerous occasions in the past and had attended the annual Speaker’s Lunch on Capitol Hill earlier in the day, where Obama was also in attendance. Email “Secret Service regrets "administrative input error" that kept Gerry Adams from White House event”. Feedback on “Secret Service regrets "administrative input error" that kept Gerry Adams from White House event”.